How much is customer service worth? NVR manufacturer OpenEye says that it's Customer Service is 'heroic', and that is why you should choose them. But who is OpenEye and should you choose them against bigger brand offerings? In this note, we examine OpenEye's claims and product offerings comparing them to well known options in the market. While OpenEye is not well-known, the company has been a surveillance manufacturer for over a decade. The company's core is designing and manufacturing video recording appliances, although it does resell branded analog and IP cameras. Until recently, the bulk of OpenEye's sales have come from OEM agreements. The 'private branding' business still represents a large part of total revenues, however OpenEye has expanded selling its own branded products. The company believes that protecting sales territories and distribution is a key part of its sales strategy. OpenEye branded product is sold through an approved dealer program and through select distributors, and aggressively polices its sales channel. OpenEye officially states it will not honor service or warranty requests on product purchased outside of authorized partners. OpenEye's VMS, a platform called Radius, is unified across the entire analog, hybrid, and IP platform product line, excluding the entry EasyDVR product. With Radius VMS, mix and matching OpenEye products are viewable and managed through a single application. OpenEye uses a traditional security dealer discount model. Because of OpenEye's limited software only availability, applications and competitive comparisons for OpenEye are constrained. While the value of software only vs appliances can be debated, clearly a large portion of the industry now prefers software only. As such, for those that require software only, unless you have a large project, OpenEye is likely not a good fit. Likewise, it would be hard to compare OpenEye vs VMS providers that focus on software only, like Milestone and OnSSI. For pricing, OpenEye's NVRs likely come in moderately higher than Exacq and moderately lower than Genetec SV-PRO but much higher than the NVR NAS options, like QNAP and Synology. From what we see of their feature sets comparisons to professional VMS/NVRs are more appropriate than NVR NASes. 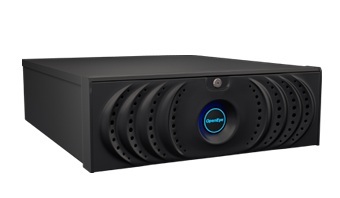 That said, we cannot tell how competitive OpenEye's NVRs are as we have not tested them.